For concert booking, please email to concert@renzhangpianist.com. To purchase CD, please visit here. Streaming Audio - Real Player required, please visit here to download the FREE Real Player. 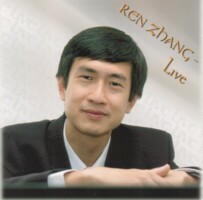 To request MP3 files, please email to MP3@renzhangpianist.com. To download sample MP3: please click on right mouse button on MP3 link and choose "save Target as" to download in MP3 format. Track 16: Manhattan School of Music, New York, 1995.